Last week was a good time to get the Cheetahs. Thomond Park was a good place to get them too. Tonight sees Munster's season get off to a proper start. Not that there's nothing to be said for a free-scoring afternoon in the Limerick sunshine, it was an enjoyable outing, but this trip to Glasgow will tell Johann van Graan far more about where his team stand. Dave Rennie is operating with a free hand when it comes to selecting his internationals, but the Irish province make the short trip without Peter O'Mahony, CJ Stander, Keith Earls and Conor Murray who is injured. On top of that, Murray's replacement, Alby Mathewson, has yet to secure a work permit. So they are already operating at a disadvantage against Stuart Hogg and friends, who secured a come-from-behind bonus point win in Galway to kick off their campaign. Still, Connacht found enough holes in the Warriors rearguard to get themselves into a commanding position. They squandered it, but Munster are rarely as charitable. Glasgow will aim to tighten up their discipline and, back on the Scotstoun surface, possess a myriad of threats to hurt their guests. Yet there is nothing to fear for the Irish side, for whom Darren Sweetnam was superb last week. The Corkman will relish the hard surface and can break the game wide open. At the end of last season, Van Graan said the key lesson he had learnt was that consistency across the season is essential to success at the end. Away semi-finals are difficult to win and the South African wants his side to cut out the slip-ups that afflicted them at times last season. He sticks with JJ Hanrahan at out-half, keeping Joey Carbery in reserve alongside Tadhg Beirne, who will make his Munster debut at some point. It's quite an impact bench. Certainly their presence alongside Rhys Marshall and Jaco Taute allows Munster keep their pedal to the floor until the final whistle. 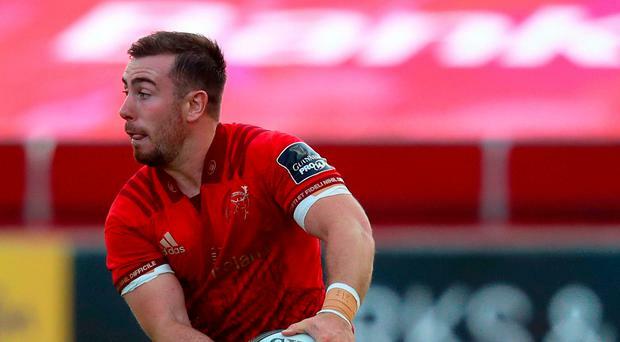 Taute's return after missing most of last season with knee ligament damage is a welcome one, while Munster fans will eagerly await Beirne's potent mix of breakdown threat and carrying capacity. The forecast of dry weather should help set up a good game, with both teams eager to mix the tough confrontations up front with plenty of width. If Munster want to win, they'll need a big effort on defence where Dave Rennie's side will test them far more than Cheetahs, while they'll want greater accuracy from Hanrahan off the tee. That said, the Kerryman was good in general play last week alongside the impressive Neil Cronin, and if that pairing can control matters under greater pressure then the chances of an away win go up. Although it's more than a year since the Warriors lost a regular season game at home, they've lost Finn Russell to Racing 92 and his absence will be felt with the ball. Munster lost on both visits to Scotland last season and, given Glasgow are Conference A rivals, they know how important these points could be. With Sweetnam in flying form, they have enough in their locker to hurt the home side if they can retain the ball through phases and hold their own at set-piece. However, the synthetic pitch swings the advantage the home side's way. They'll be buoyed by their performance at Connacht and know that without their front-line internationals, Munster are not at the same level so expect a physical game. It's the first test for Van Graan's men and, at the start of a long campaign, it would be no disgrace to leave Scotstoun with a losing bonus point.